John Tyler was the 10th President of the United States. He was born in 1790 and took office in 1841. 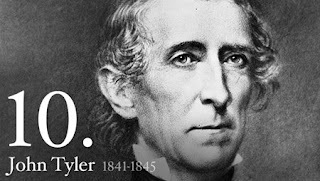 His son, Lyon Gardiner Tyler, was born in 1853, when Tyler was 63 years old1. Lyon had six children with two different wives2, two of whom were Lyon Gardiner Tyler, Jr. (born 1924 when Lyon Sr. was 71) and Harrison Ruffin Tyler (born 1928 when Lyon Sr. was 75). They are reportedly both still living in their 80s.